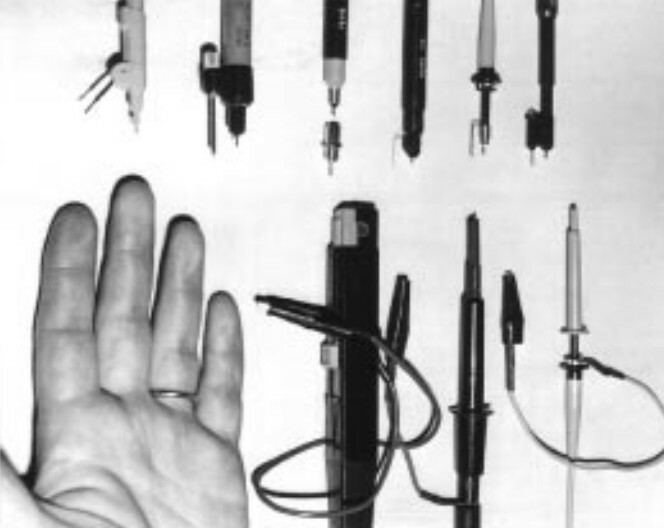 Jim Williams’ selection of oscilloscope probes including his hand appeared in more than one LT app note, and inspired one of our April Fool articles a couple of years ago. Data sheets can be informative and comprehensive, but by their nature are limited to only a single device or a few near-identical ones. App notes are more analogous to a technical article about an engineering issue with a more wide-ranging remit, and the best ones could almost be considered in the same light as a book chapter in something like my Horowitz & Hill — once you have read them you have gained a thorough grounding in the topic they cover. Sometimes they can save your bacon on a difficult project, as this Linear Technologies app note did when I was on a contract that had exacting demands on a high-voltage flyback converter. It was appropriate to start with that LT app note, because its author was the analogue engineering guru and doyen of the app note, the late Jim Williams. During a career from the late 1970s to his untimely death in 2011 he wrote a huge trove of them, first for National Semiconductor and then for LT, that were simultaneously incisive and comprehensive while containing wit, humour, and of course his trademark hand-drawn cartoon on the final page. 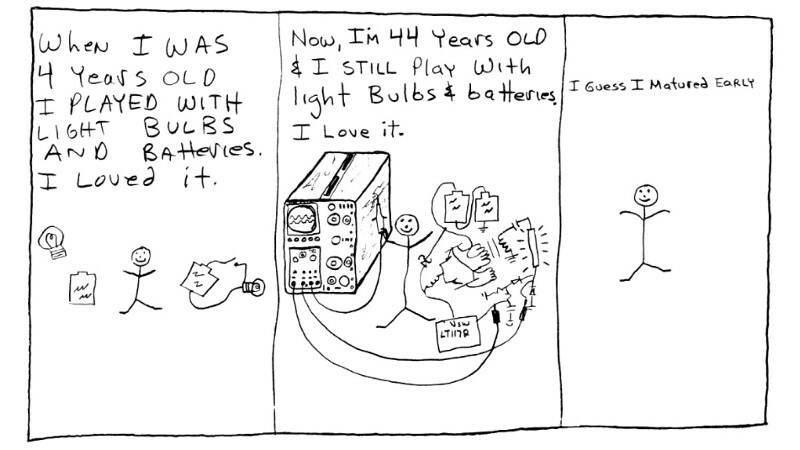 His cartoon shown below is from LT AN49 Illumination Circuitry For Liquid Crystal Displays. I have learned so much from his LT app notes, and my life as a Hackaday author would be complete if I could emulate his writing just a little bit. Who else could write something like LT’s AN25 with the title “Switching Regulators For Poets” for example, or AN47, High Speed Amplifier Techniques, that is something of a seminal work on the subject at hand. I haven’t read them all by any means, and I should at some point sit down and make some effort to rectify that omission. Of course, while this has given me a chance to wax lyrical over one author’s work, all the major semiconductor companies produce application notes. Sometimes they are little more than dry collections of data sheet information, but among them are still works from which any engineer should gain something. Maxim Integrated’s Choose The Right Regulator For The Job series approaches book length in this vein, coming in 3 parts with app notes 5998, 5999, and 6071. Another document of this type that I’ve found of great help is TI’s AN058 Antenna Selection Guide, which gives the reader a comprehensive primer on all types of PCB antenna for the commonly-used ISM bands. There’s a school of thought that designing your own PCB antennas is a black hole for an engineer, but should you have a mind to do so this app note will prove an invaluable resource. A typical function of an app note is to look at a reference product design in far greater detail than the data sheet for the device it uses. The power supply shown in NXP’s AN11401 TEA1720/TEA1705 5 W to 12.5 W power supply/USB charger is a typical example of the type, and in the NXP engineers doing all the hard work the company hopes that designs such as this one are lifted lock, stock, and barrel into customer products. These reference design app notes don’t always have to feature integrated circuits, for example AND2SK3557/D AM Radio Amplifier Module with Filter Using the 2SK3557 is an ON Semi document featuring a FET. Most readers could spend a happy afternoon, a day, or even a week trawling through semiconductor application notes, because there is such a wealth of interesting stuff therein to be found. But we’ve got only the space of a Hackaday piece to list them in, so if any of you have favourite app notes please add them below in the comments. And if the world of app notes is new to you then you are in for a treat! Dive into your nearest semiconductor company’s website, and start reading! Going off on a tangent, what is that diode-in-a-diamond symbol on the far left of the schematic? That looks right. I’ve never seen it shorthanded like that before. Another symbol for it is the one Big Clive uses: IIRC, a portrait-oriented rectangle with a diagonal diode inside, with two terminals on the left for AC and two on the right for DC. Looks like a full-wave bridge. That new style diode with a line through it always looks like an error to me, like an overprint on a wire. The “new style” is at least four decades old. The TI Handbook of Operational Amplifier Applications (http://www.ti.com/lit/an/sboa092b/sboa092b.pdf) is a must-read for all electrical folks, and the Microsemi PIN Diode Circuit Designers’ Handbook (https://www.ieee.li/pdf/essay/pin_diode_handbook.pdf) is a godsend for RF engineers. Man, I wish I had known about that PIN diode guide a few months ago. There’s some font weirdness, though — I dunno if it’s just my system, but their Greek letters are messed up. Pi shows up either as xi, or a hand-making-the-OK-symbol wingding (which is an underappreciated bit of mathematical notation). At least they managed to lay it out such that the pi attenuator circuit is Figure 3.14 — we see what you did there, nerds of 20 years ago. App notes were a tremendous source of ideas. Don’t forget the circuit ideas sectio0ns of the weekly’s and monthly’s like “Electronic Design” and “Electronics”. Top of my list was the shelf of data books from National – the blue books. The most thumbed and marked up with notes was the volume of analog app notes “National Semiconductor Linear Applications Handbook”, (actually one that predates the blue series. Blue series is much bigger). Then TI, which are written in a much Les readable way. Analog Devices had complete hardback books for free on precision amplifier and ADC/DAC use, and later, DSP and sampling theory. The LT notes are great. If I recall, they first got a lot of attention due to the chopper amplifiers in a chip. National had an app booklet for the LM324 called “Quadzilla” that has pages and pages of application circuits. H&H came along after I was working. It is a good read and I have referred to it maybe three times since. These days it is easier to Google for more specific and deeper examples. I have two shelves of EE text books from publishers who give them away and I virtually never open them. (Most of them are instructor editions with problem answers if anyone needs a study book). I would like to hear everyone’s favorite app-note source. Motorola. Burr-Brown had some nice stuff as well. Motorola “RF Device Data” – has a series of Application Notes that include impedance matching on Smith charts. Either the NS Linear Applications Handbook or the NS Audio Applications Handbook has a chapter titled ‘Floobydust’, which I have always regarded as priceless. We were getting rid of old stuff last year and $SPOUSE reached for the Blue Books on the next shelf down. I had to shout ‘Oh look! Squirrel!’ and hid them while the distraction lasted. Any relation to floobydust on http://forum.6502.org? BTW, THAT semi is the new cool kid on the block for run fun audio parts, good datasheets and app notes and well annotated reference designs and pcb layout suggestions. An article in praise of App Notes and Datasheets…. In the beginning of April…. I can’t help but feel opportunities were missed. While not app notes, the great books by Walt Jung, Don Lancaster, and Forrest Mims III and a host of others, are seminal works for the times. Some of their information is almost unavailable anywhere else. These guys are legends. Well that’s disappointing. I tried to look up Natl Semi’s old LH0033 and LH0063 datasheets, and they’re no longer called “Fast and Damn Fast Buffer Amplifiers”. Now they’re called “fast and Ultra fast”. Bleah. Ah, ““Switching Regulators For Poets”. That brings back memories from a time when Ol’ Backwoods was but a lad of an electronics engineer. A classic. Loved Jim Williams, RIP. It’s also completely relevant to op amp circuit design today. The Phiblrick P-2, from the early 1960s, had picoamp input leakage current and offset voltages of a few microvolts, so you’d have to select today’s op amps carefully to get the kind of performance mentioned in the Applications Manual. Gosh, that’s a good one, thanks! One of my favorite blogs is readingjimwilliams.blogspot.com/ . The author shares my passion for 60’s tek scopes, and from 2011 through 2012 has gone through all of Jim Williams application notes, and writes a small overview as he reads through them. It’s a great introduction into the breadth of Jim’s work, and a touching homage from someone who knew him well. Ah, AN72 is a source of the ‘finger probe’ photo. Used to add capacitance to a circuit, or with a lick of the fingers, add resistance! There was an APP note published in in the late 70’s featured an application note for the MC6883 synchronous address multiplexor that was the basis for the design of the original Radio Shack Color Computer. Same app note led to the Dragon 32, hence the similarities between the two machines. Having said that, the need to run Microsoft 6809 BASIC probably limited the design choices too. Does anyone else remember the RS Components data sheets? In this case, the app notes were written not by the component manufacturer, but by a distributor. I think they supplied them for free on request, alongside your parts order. You could buy a ring-bound complete set of them as the “RS Data Library”.